Grutness Voe is situated on the south mainland of Shetland between the airport and Sumburgh Head. The geography of the area is an extremely complex series of deeply indented bays, cliffs, beaches and settlements. 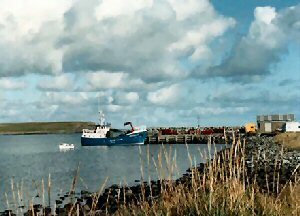 The pier at Grutness is the terminus for the twice weekly passenger ferry to Fair Isle.